Chief Minister Kalikho Pul has unveiled plans to achieve stable power supply or a ‘ power cut free Arunachal ‘ to all the administrative centres in the state, from circle headquarters to district headquarters by 2017-18. To achieve this, power will be generated locally by developing small hydropower projects of capacity 10KW to 2MW in all potential rivers and rivulets near the administrative centres, Pul told at a gathering of high officials from power department here today. Setting the completion target of a maximum of 2 years, Pul informed that all the power projects will be developed by the state government – and also with the help of PSUs, private developers and the government of India. Outlining his concept to achieve electrification of all the administrative centres, he said the majority population and important institutions are in these places – such as, government employees, traders, local population, hospitals, schools, colleges, offices etc. He also informed that other un-electrified villages and towns will covered soon in phase wise and planned manner, informed the chief minister. For this to achieve, he informed that state has plans to electrify 80,000 households by 2017-18 through solar power plant, which has the backing of union government with 90 percent subsidy. To implement the solar power programme effectively, Pul urged cooperation of the department for survey of all the beneficiary areas. 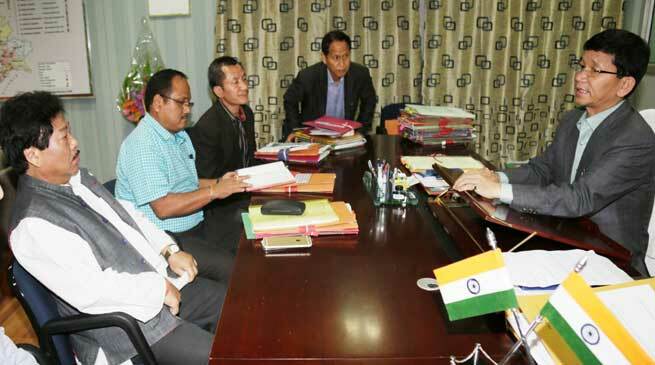 To start with the plan to develop small hydropower projects, Pul requested the department to prepare a district wise, sub-division and circle wise status – on all the MoUs signed by the power developers in the state. He also sought ground status of all the functional and non-functional hydels and power projects – on their total assets, manpower, infrastructure, condition of power house and equipments. Seeking actions required to supplement the functional ones and to restore the non-functional projects, the chief minister urged the officials to prepare feasibility report of all the existing projects. To develop new hydel and power projects wherever required, he requested to make assessment of the power potentials of all the rivers and rivulets near the administrative centres. He also urged the assessment to be specific on power generating feasibilities of the rivers and rivulets – even during the lean period, so that the project should not remain redundant in later years. Acknowledging lack of coordination between Power and Hydropower (Civil and E&M) departments, the chief minister assured to clear charter of duties with the departments to improve coordination and work efficiency. Further, Pul assured that Banderdewa to Itanagar road will be fully electrified by the end of the year. Also high mast lights will be erected in all important and sensitive places in the capital city such as schools, colleges and hospitals, he added.